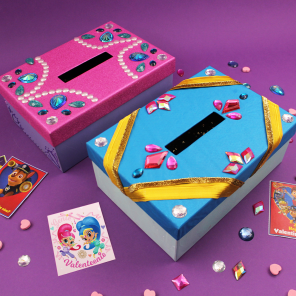 This craft is easy, sparkly, and perfect for a genie-themed birthday party. 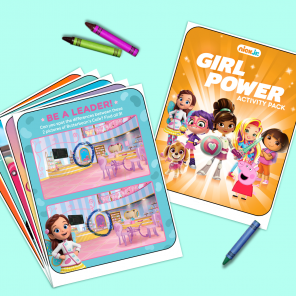 Shimmer and Shine is all about teamwork, friendship, and perseverance. Oh, and let’s not forget all the pretty gems, too! One of the great things about being a genie is the ability to make things more beautiful. Turn duct tape into magnificent bracelets with a little bit of gem ribbon. 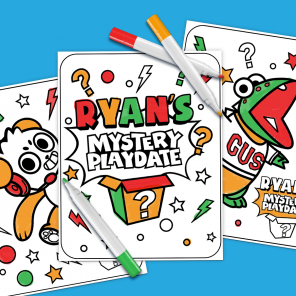 This is the perfect activity for your child’s genie-themed birthday party. Step One: Start by making a fun sign. Decorate the paper with gems and glitter glue. Glue the sign to a piece of glitter felt, with the edge of the felt peeking out. Then glue the felt onto a piece of cardboard for extra sturdiness. Once try, trim the excess cardboard around the edge. Ta Da! 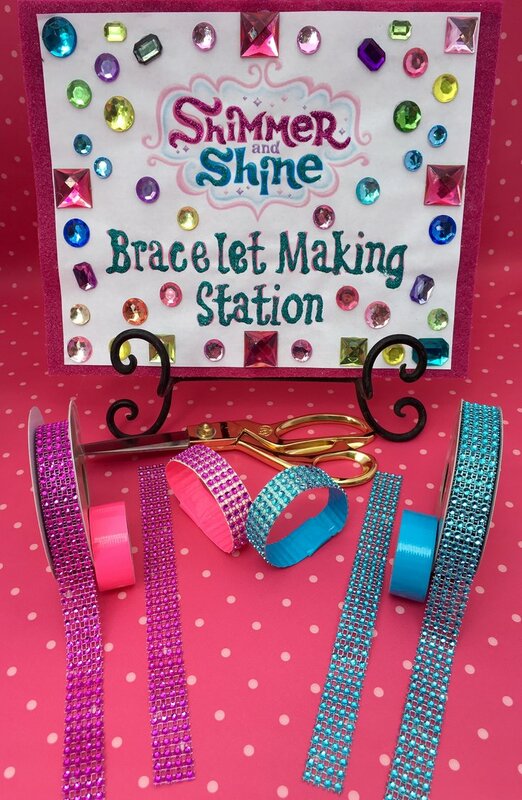 You now have a beautiful sign for your Shimmer and Shine Bracelet Making Station. Step Two: In front of the sign, set-up everything you need to help party guests make their own Shimmer and Shine bracelets to wear at the party. Set out the rolls of gem ribbon, duct tape, and the scissors. Step Three: Wrap the ribbon around one child’s wrist, leaving a bit of slack to slide the bracelet on and off. Use the scissors to cut the ribbon at that length. Then cut the same length of duct tape. Allow the child to assemble their bracelet by laying the duct tape down, sticky side up. They can press the back side of the gem ribbon onto the duct tape so that the gem side is facing up. Make sure they line up the ribbon and duct tape at the end. The tape and ribbon will easily come apart if they need to start over. Wrap the bracelet around the child’s wrist and secure in place with another piece of duct tape around the two overlapping ends. Repeat these steps for each child at the party.